Vancouver Presents is live with Craig Lauzon, star of the Talk is Free production of Tales of an Urban Indian. Many will recognize Craig Lauzon for his work on the CBC comedy series Royal Canadian Air Farce. From portraying former Prime Minister Stephen Harper to his upcoming portrayal of Doug Ford in the show’s annual New Year’s Eve special, Lauzon has been entertaining Canadian television audiences for over fifteen years. What you might not know, in addition to being part of this national comedy platform, Lauzon is also an accomplished stage actor. Currently in town to perform in the Talk is Free Theatre production of Tales of an Urban Indian, the show opens the 2018-2019 Presentation House Theatre season. Uniquely told on a moving vintage 1964 transit bus, Tales of an Urban Indian is a one-man show that tells the story of Simon Douglas, an indigenous man born on a reserve in British Columbia in the 1970s and raised both on the reserve and in the city of Vancouver. As the bus meanders through the North Shore and across the Lions Gate Bridge to Vancouver, Lauzon tells the story from Douglas’ perspective and that of a couple dozen other characters in his life. And while the bus ride may first be viewed as a theatrical gimmick, this darkly funny story takes on new meaning as the bus passes through the Downtown Eastside, an area Douglas finds himself both trapped and liberated by his circumstances. We caught up with Lauzon after the show in a live interview to find out more about performing this impactful piece on a bus. Tales of an Urban Indian continues its run at North Vancouver’s Presentation House Theatre until September 30. Visit phtheatre.org for departure times. 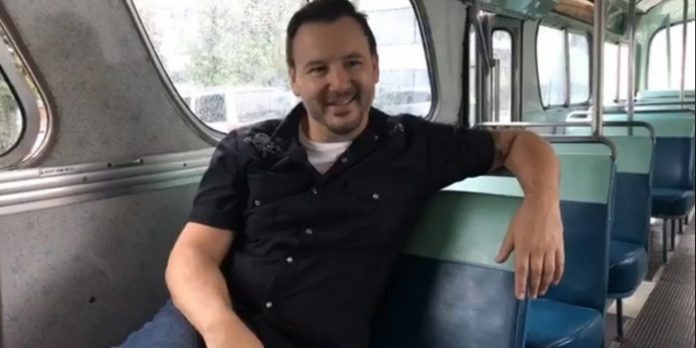 We are LIVE on a vintage 1964 transit bus outside Presentation House Theatre as we chat with Craig Lauzon, who is performing in the Talk is Free Theatre production of Tales of an Urban Indian.Be sure to LIKE and SHARE our broadcast with your friends!Tales of an Urban Indian departs North Vancouver's Presentation House Theatre until September 30. Visit http://www.phtheatre.org/tales-urban-indian/ for tickets and information.